These mini muffins are moist and fluffy and you won’t believe there’s no flour involved. I’ve been baking long enough now that I can usually hold off and wait until something has cooled before “taste testing.” But I was unable to hold back my excitement after coming up with this idea the other day and then having it turn out just as I wanted. The muffins are not too sweet, so they work for breakfast as well. 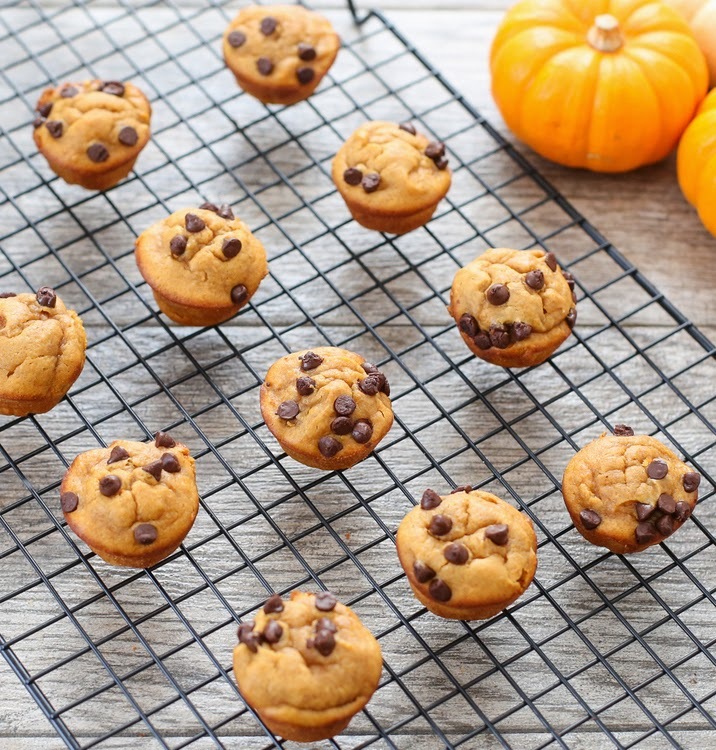 The flavor is more peanut butter than pumpkin. 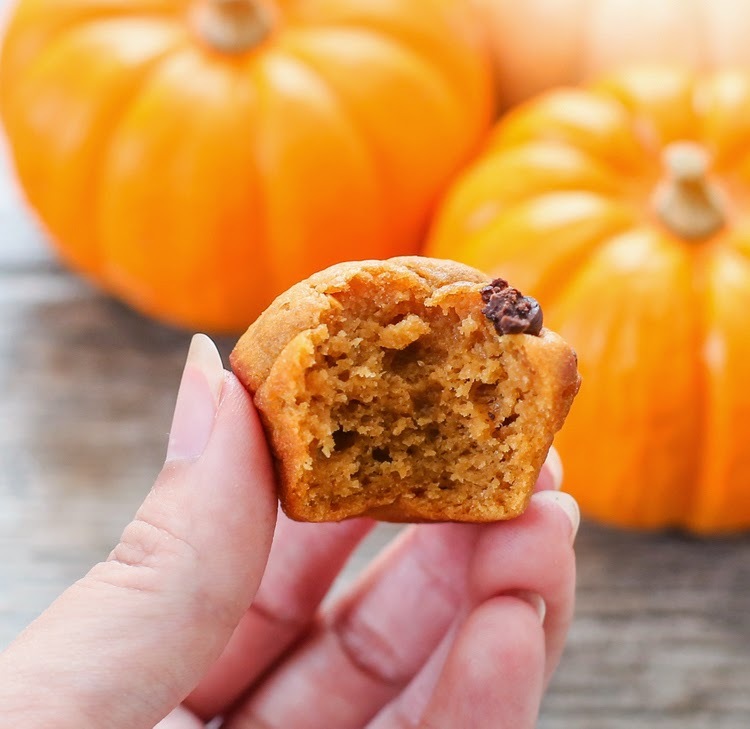 The pumpkin is actually used more to create the cake-like texture, but the flavor is subtly there, underneath the peanut butter flavor. 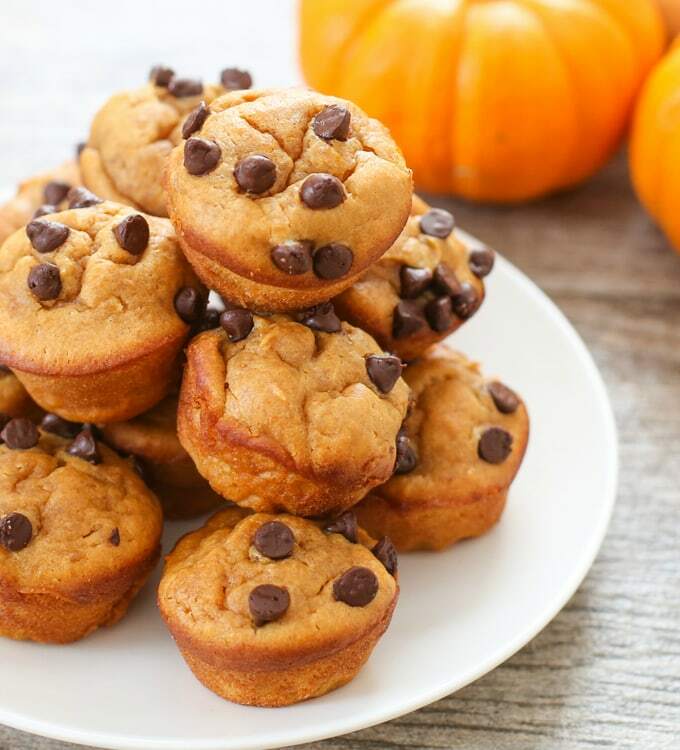 If you want to make these a little more “pumpkiny,” you can add cinnamon spice or pumpkin spice to help enhance the pumpkin flavor. This batter requires one bowl and a whisk. I love easy recipes with very little clean-up. Next time, I’m making a double batch because I finished these little guys in one day. New! Recipe now updated with video. You can also find all my recipe videos on my youtube channel. These mini muffins are moist and fluffy and you won't believe there's no flour involved. Preheat oven to 350ºF and grease mini muffin pan. 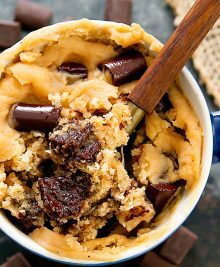 Combine all ingredients except chocolate chips into a large mixing bowl. Mix with a whisk until batter is smooth. 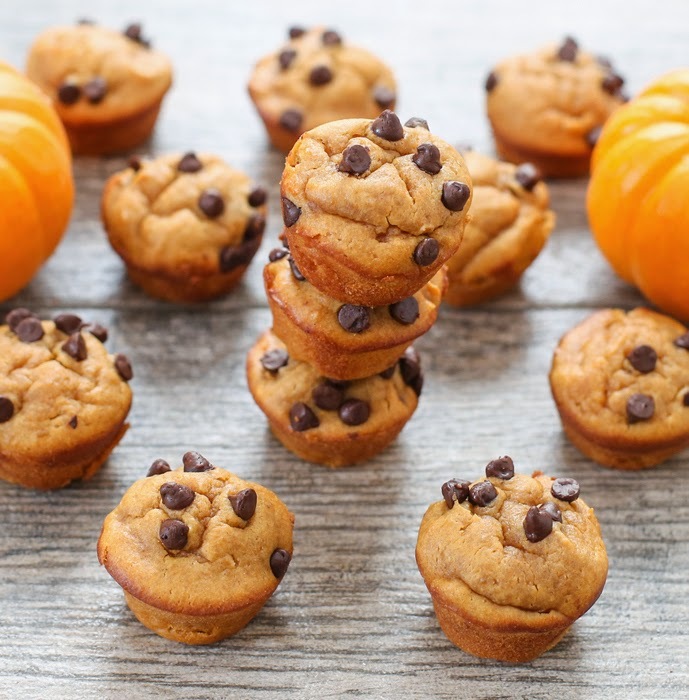 Fill mini muffin molds 3/4 full. Sprinkle a few chocolate chips on top of each one. Bake for about 10 minutes or until toothpick inserted comes out clean. because of the consistency/texture. I prefer to eat natural, but when it comes to baking, there are often issues and the recipes don’t come out right which is why I always use regular pb for baking. No flour? Can’t believe it is so easy. But the recipe doesn’t have whole lot of ingredients ,can not imagine it will make 14 mini muffins. Very clever! Love the low sugar content, pinning these for my remaining can of pumpkin puree!! These are the cutest little bite size muffins ever.. totally could polish off the whole tray right about now. Great recipe Kirbie! Thanks! Yes they are super cute! which is almost a bad thing because I couldn’t stop eating them! I’m really happy it worked out! These are so cute! 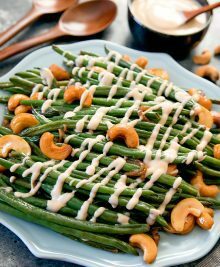 I want to make these for Thanksgiving. Girl, you are my new favorite blog! Love your recipes. You totally inspired me to get an ice pop mold and I’ve been using your recipes. Just made the blueberry greek yogurt ice pop today, yum! Can you recommend a Chicago based food blog? (or please move to Chicago and critique our restaurants) Thanks! 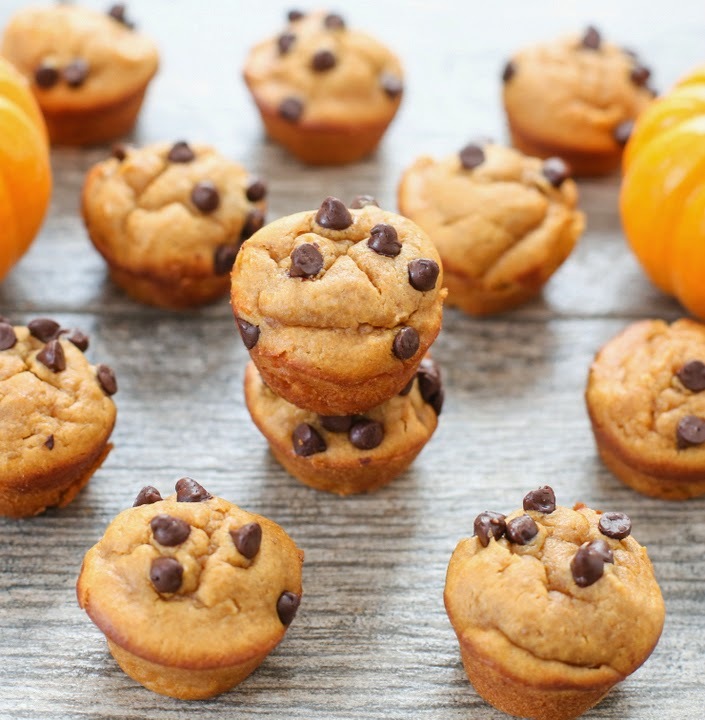 omg these little pb & pumpkin muffins are adorable and look so moist! 🙂 will pin for future, thanks! hope you get to make them soon! @barb, here is another Chicago based blog that I recommend, http://www.whatscookinchicago.com. I actually met Joelen Tan (the blog author) during my Chicago trip in 2009. She has a lot of great recipes and reviews of tons of places. I’m not sure if she still organizes culinsry neighborhood tours, but I found her blog to be quite useful prior to our trip. Thanks for the blog recommendations! I tried these today and whilst they definitely did not look as nice as yours, they were still pretty tasty! I had to mess about with the ingredients a bit as I don’t have any measuring cups, but I think they turned out pretty good! They were just a tiny bit greasy, is all. Mine tasted very peanut buttery. Hope that helps? Also mine weren’t greasy at all, so maybe it was because you weren’t using measuring cups? I made them! Very tasty but I think I messed up the muffin look bc I mixed in the chips or had too many chips. Still yummy tho. Mine tasted mostly like peanut butter, too. I sprinkled my chips on top so they’d stay there. you can definitely mix chips in too, but i’d recommend reserving a few to sprinkle on top. 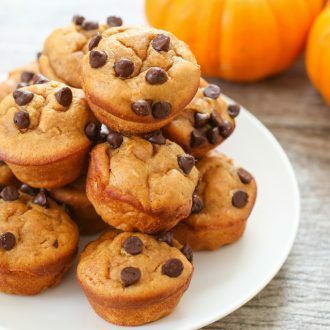 I made these with Pb2 instead of regular peanut butter and they tasted great! I did have a problem with them sticking to the bottom of the muffin tin a little bit, even though I sprayed the tins beforehand. Is that normal for this recipe? Hmm, I didn’t have any issues with mine sticking. though I recommend using a skinny small spatula to help lift them up. you can also line the muffin pan with mini cupcake liners. Do you have a calorie count on theses?